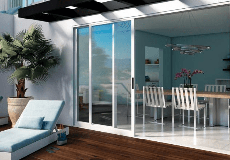 Removing your patio door screen does not need to be a chore. Follow our instructions and watch the video below to easily remove your patio door screen and make any necessary adjustments. It should take about 10 minutes to complete the process. Step 1: In order to remove the door screen, it must come off of the rollers. You’ll see inner screws at the bottom of either side of the screen. Using a Phillips screwdriver, turn the screw counter clockwise to raise the screen up until you see the head of the screw. Repeat on the other side. Step 2: Raise the screen slightly to find the wheels on either side. You’ll want to place the putty knife under the wheel and then push in and lift. Once the wheel is up, you will be able to slide the screen towards you. Do both sides and the screen is removed. Step 3: When you are ready to reinstall the screen, just line up the top two wheels back inside the track and push up the screen as high as it will go. Hold the screen out slightly and push the wheel up with the putty knife and slide the screen back into the track. Do the same on the other side. Step 4: It’s important to adjust the rollers before using the screen again. Take your Phillips screwdriver, turn the screws clockwise until you see visually see the screen lowering back into the track. Repeat on the other side. Step 1: On the screen door handle, you’ll find a small plastic bag that contains the latch. Unscrew to remove it and adjust the door latch to its lowest position. Step 2: In order to be sure you are lining up the latch properly with the screen door, put a removable mark (painters tape or pencil) on the door frame that is level to the bottom of the handle tab. Note: This is the lowest place where the point of the keeper should reside for the tab to engage. Step 3: Use your Philips head screwdriver and insert one screw into the bottom hole. The screws should be about ¼” apart. Step 4: Note that whenever the screen is re-installed, always check that the keeper is still in the optimum location. You can adjust it by loosening the 1st screw. Then the keeper can be moved where you need it before you retighten. Step 5: Check to make sure the screen operates smoothly. Step 6: Install the second screw into the top hole. Still need help? Visit Milgard Support online. I'm glad I found this article with the video included. It helped me with my project. Very informative. Thanks for the help.